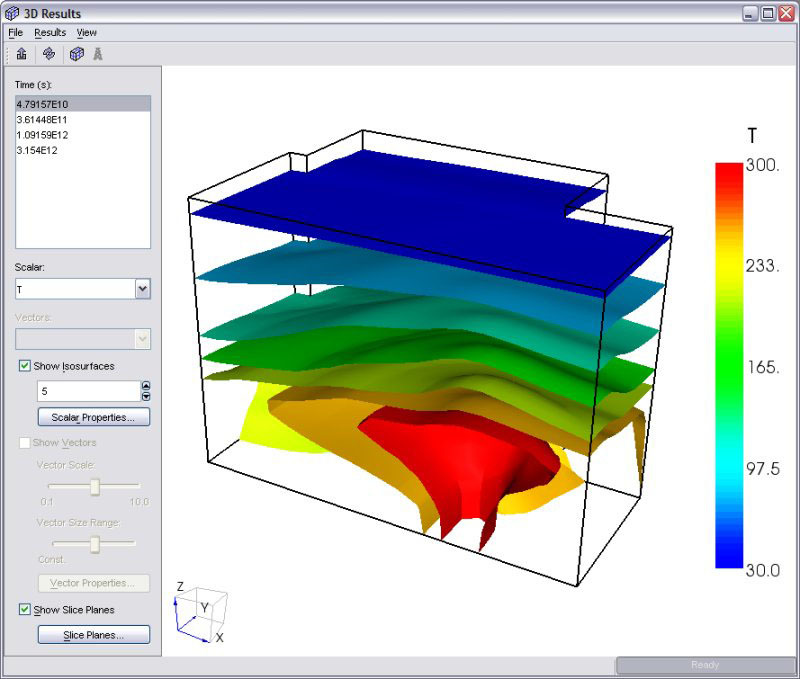 PetraSim is the graphical interface for the TOUGH2 family of simulators – used to solve problems related to geothermal systems, carbon sequestration, multi-phase contaminant transport and more. PetraSim is the graphical interface for the TOUGH2 family of simulators. Developed at Lawrence Berkeley National Laboratory, TOUGH2 and its derivatives are recognized for their powerful simulation capabilities for fluid flow and heat transfer in porous and fractured media. The TOUGH2 codes have been applied to problems ranging from Yucca mountain groundwater flow to multi-component environmental remediation. 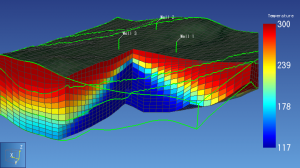 PetraSim makes the power of TOUGH2 accessible to modelers through an interactive 3D environment that includes mesh generation, parameter definition, and display of results. 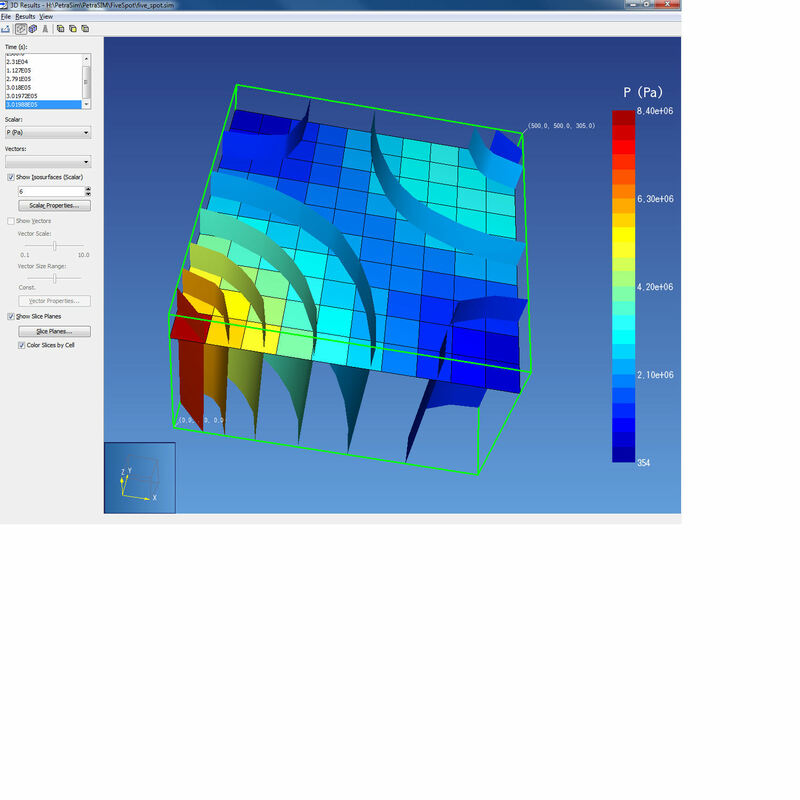 PetraSim significantly lowers the barriers to TOUGH2 use by freeing the analyst to focus on the model, while automatically handling the complex details of TOUGH2 input and output files. PetraSim includes TOUGH2 (version 2), T2VOC, TMVOC, and TOUGHREACT (version 1.2) executables. TOUGH version 2.1 and TOUGHREACT v2.0 are supported and can be purchased for an additional fee. HydrateResSim is also supported and must be acquired from NETL for use with PetraSim. PetraSim also includes limited support for TOUGHREACT v3.3 and TOUGHREACT-Pitzer. Grouping of source/sink cells using source/sink names. 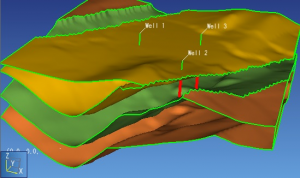 This makes it possible to correctly assign production when multiple wells intersect the same cell. Writing of SAVE file at specified time steps. Additional results output in GOFT file for EOS2 and EWASG. New capillary pressure and enthalpy options in EOS2 and EWASG. 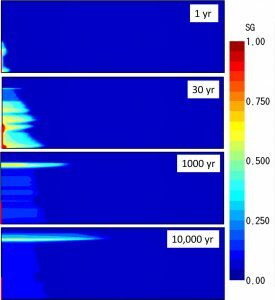 Improved convergence during EOS2 change of phase. A TOUGH2 interface, and much more! PetraSim supports the TOUGH2 family of codes, including TOUGH2, TOUGHREACT, TMVOC and TOUGH2-MP. HydrateResSim and TETRAD are also supported. PetraSim supports most of the Fluid Property Modules in the TOUGH family of simulators. 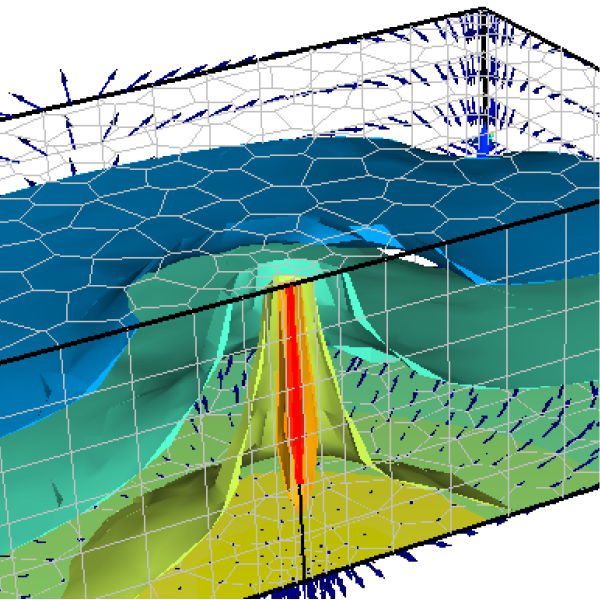 PetraSim and TOUGH2 have long been the standard for geothermal reservoir simulation, with users spanning the globe. 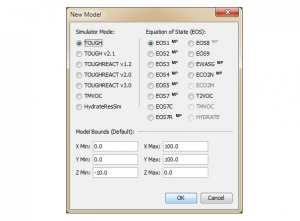 The ECO2N (TOUGH2 and TOUGHREACT) and ECO2M (TOUGH2) simulators supported by PetraSim are widely used to simulate subsurface CO2 sequestration in saline aquifers. See a list of new features added to PetraSim in recent years. I already own the TOUGH2 simulator, can I just purchase the PetraSim Core Module? When you purchase PetraSim, you must purchase the PetraSim Core module plus the interface module(s) for the simulator or simulators that you want to run through PetraSim. We do not offer discounts to customers who have purchased the TOUGH2 simulator or source code through LBNL. What simulators are packaged with PetraSim? PetraSim includes free executables for supported TOUGH2 (version 2.0), T2VOC, TMVOC and TOUGHREACT (version 1.2) modules. Use of ECO2M, EOS7C, TOUGH v2.1, TOUGHREACT v2 and TOUGH2-MP with PetraSim requires that you own the simulator. You can find pricing for these simulators on the LBNL TOUGH2 website. Is maintenance available for PetraSim? Permanent PetraSim licenses include annual maintenance for one year. After the first year, annual maintenance can be renewed for 20% of the retail price at the time of renewal. PetraSim does not include the HydrateResSim simulator. It can be acquired through NETL free of charge. Is network licensing available for PetraSim? Network floating licenses, quantity discounts and academic teaching licenses available. Contact RockWare ([email protected]) for more information. Does PetraSim include the TOUGH2 source code? PetraSim does not include the TOUGH2 source code. If I purchase the TOUGHREACT interface, will I have access to TOUGH2? The TOUGHREACT interface does not include access to the TOUGH2 simulators. You can disable the reactive transport tools in TOUGHREACT and the results of the model will be identical or nearly identical to a model run with the corresponding TOUGH2 executable. Keep in mind the the TOUGHREACT does not support all of the EOS modules that are supported by TOUGH2. What type of technical support is included with annual Maintenance? RockWare and Thunderhead Engineering provide standard technical support for the PetraSim interface and included simulators. For extended support beyond software problems and errors, including theoretical simulator questions and model setup, users may post to public internet forums or arrange for consulting. Detailed simulator support, including reactive transport in TOUGHREACT may require a source code license from DOE/LBNL. What are the system requirements for PetraSim? Windows NT, 2000, 98, ME and Vista are not supported. Use the links below to access PetraSim support resources. Documentation: Download the PetraSim user manual, tutorials, and access links to additional documentation. To ask questions about PetraSim or the TOUGH2 suite of codes, please visit the RockWare TOUGH2/PetraSim online support forum. 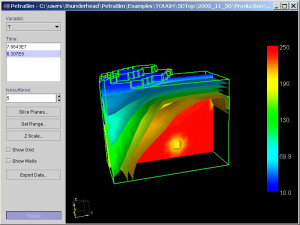 Additional example problems and resources can be found on the PetraSim Support Resources page hosted by Thunderhead Engineering.